KOLKATA: The Central Bureau of Investigation has named Nalini Chidambaram, wife of former finance minister P Chidambaram, in its seventh supplementary chargesheet in the Saradha Ponzi scam. 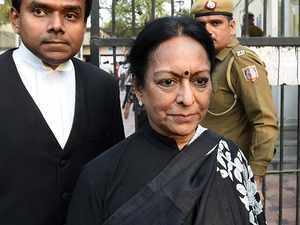 Nalini Chidambaram is charged with criminal conspiracy, cheating and dishonestly inducing delivery of property and criminal breach of trust under the Indian Penal Code, for entering into “a criminal conspiracy with Saradha chief Sudipta Sen”, states the charge-sheet. According to the CBI, she had taken Rs 1.4 crore from Sen for helping and advising him to evade inquiries by regulatory authorities. The money that the senior advocate was paid was proceeds of crime as it was illegally collected from investors by duping them, CBI sources said. The Enforcement Directorate is separately probing the money trail in the Ponzi scam. The directorate had issued several summons to Nalini Chidambaram. However, she moved court seeking a stay. She was first examined in connection with the case in September 2014.